Real Madrid had to sweat to their home match earlier today against Malaga, but nonetheless the 3 points stayed at the Bernabéu. Cristiano Ronaldo returned to scoring ways in the Spanish League, as he set the final score in 3-2 in favor of Real Madrid. Even when it's supposed to be easy it isn't... It seems this season's Real Madrid side aren't going to give us any break from the drama. 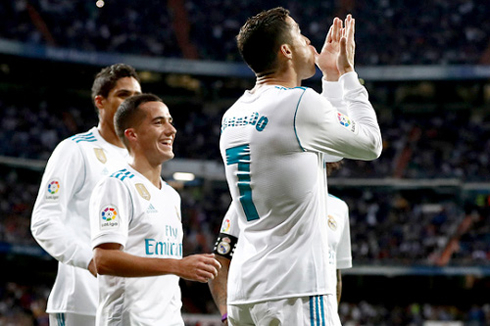 What should have been a straightforward game against a Malaga side that have failed to make any real impact on the road this season, instead turned into a nail-biter, as Real Madrid had to dig deep to hold onto a 3-2 victory over their Andalusian foes. Cristiano Ronaldo found the back of the net in La Liga only for the second time this season, but today his goal was crucial to keep the 3 points in Madrid. With Luka Modric on the bench and Isco filling in for him, it seems as if Zidane is beginning to truly see the merits of the 4-3-3. Lucas Vasquez was again deployed on the right and though as I mentioned before he isn't Real Madrid starting caliber, simply having him occupy that position makes the world of difference in terms of the team structure. 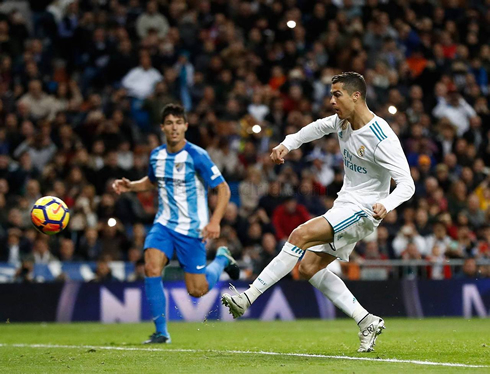 Goals from Karim Benzema, Casemiro and yes Cristiano Ronaldo did the job today, but it was not easy as a few mental lapses got Malaga back into the game on multiple occasions. Benzema opened the scoring after a simple tap-in following Ronaldo's well-placed header that ricocheted off the crossbar. It was an easy tap-in for the Frenchman, who's now managed to score in multiple games. But it's never easy with Madrid and soon some lax defending in the box allowed Diego Rolan, the Uruguayan, to grab one back for Malaga. As a crescendo of whistles came down across the Bernabeu, Real Madrid tried to kick it into higher gear knowing that any more dropped points would render what seems like a lost season already, into a funeral procession of sorts. Thankfully Casemiro would quell those fears with a header just three minutes after. 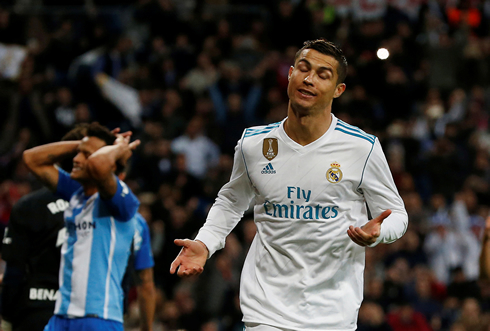 Real Madrid went into the half with a 2-1 lead, but a nervous Bernabéu knew it wasn't exactly a foregone conclusion, especially after a supposed Malaga goal right as the halftime whistle blew looked to be waved off incorrectly. But, given Madrid's form this season, what can go wrong does go wrong and soon they were tied again after the break. Chory Castro's shot was poorly saved by Casilla and the ball bounced into the back of the net. It was a good shot to be fair, but Casilla should have done far better. Things were looking grim again, until we got the familiar sight of Ronaldo being the hero again as he was back among the scoresheet after finishing off a missed penalty in the 76th. Given Ronaldo's poor form in front of goal (in fact, it seems like the Gods are against him sometimes), it was no surprise he missed the penalty, but the sense of relief was palpable across his face as the put in the rebound, which would eventually go down as at the match winner. Cristiano Ronaldo next game for Real Madrid is on November 28 of 2017 against Fuenlabrada. You can watch Juventus live stream, Real Madrid vs Fuenlabrada, Valencia vs Barcelona, Huddersfield Town vs Manchester City, Burnley vs Arsenal, and Southampton vs Everton, all matches provided from our live football game pages.